Thinking Devices manufactures products that span a wide range of markets and industries. We have designed and built custom electronic products currently in use at major international corporations such as Lexmark International, Toyota Motor Manufacturing, and Weyerhaeuser. We've also developed electronics for many small companies and universities. 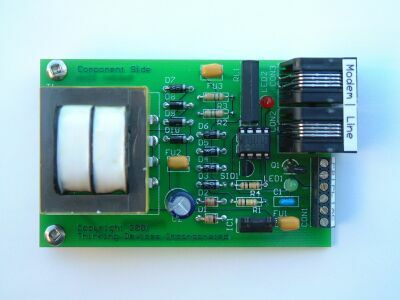 If you need a custom electronic product, we can design and manufacture it. LED displays and LCD operator panels. Pressure measurement and pressure adjustments. Audio output - piezo buzzers and speakers. Audio frequency analysis of complex waveforms. Load cells or force sensitive resistors for force or weight measurement. Motor control - servo, stepper, universal, brushed DC, synchronous AC. Inductive and capacitive proximity sensors. Numerous types of conveyors and sortation systems. Encoded digital RF data transmission. All of our products include complete documentation sufficient to allow the work to be independently replicated without any additional engineering. The end user documentation is clear and concise. We deliver all documentation in non proprietary industry standard formats, such as HTML, DXF, JPG, PDF, etc. Here are a few images that demonstrate the quality and value of our custom products. This is a low cost custom industrial product used to prevent unauthorized access to modem connected manufacturing equipment. We provided a complete solution, including on-site installation and testing. Thinking Devices designed and manufactured a solid state digital control system to replace an open loop control system in an existing semiconductor wafer washer. The original system used relays and mechanical timers, with no process monitoring. The upgrade provides complete closed loop process control with programmable high/low alarm settings, a password protected maintenance menu, enhanced safety, and improved maintainability. The operator interface was reduced to four pushbuttons. This equipment is now almost maintenance free in a 24/7 manufacturing operation. Upgrading the existing equipment allowed the customer to retain their capital investment while benefiting from substantial upgrades, improvements and many new features and capabilities tailored to the customer's needs. 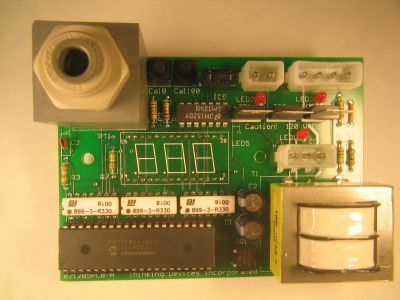 This printed circuit board was used to modify a piece of manufacturing equipment to avoid a potentially hazardous condition by using a mechanical interlock to prevent an operator from removing the lid of a pressurized vessel. A redundant fail-safe technique is employed. The large custom pressure sensor at the upper left was manufactured in-house using a small pressure sensor intended for light duty PCB mounting. The low cost sensor was packaged in a very rugged housing to survive a harsh industrial environment. It incorporates an integral filter. The pressure sensor is quickly calibrated in software with a simple two point calibration procedure. The calibration values are then stored in nonvolatile flash memory. During operation, the pressure is displayed on a three digit LED display located on the back side of the PCB. The pressure display is accurate to better than 1 PSI over the range of 0-120 PSI. This PCB was designed to replace an analog pressure gauge in an existing machine panel, simplifying installation while improving a familiar user interface. We provided a complete solution, including on-site installation and testing. 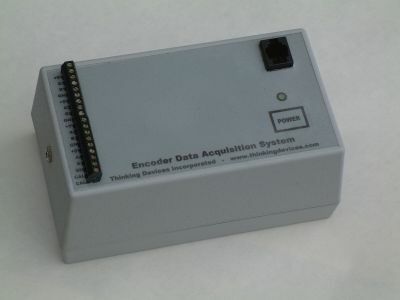 This prototype high speed 4-channel encoder data acquisition system is a simple and effective solution to a difficult problem. There are five processors collaborating underneath the modest exterior, each operating at 5 million instructions per second (MIPS). There's also 8 MB of flash memory to store data. Each of the four channels of data is sampled with 200 nanosecond resolution, which means this device can acquire four discrete data samples in the time required for light to travel 196 feet! The data is buffered to flash memory, then transferred to a PC via a 115,200 baud RS-232 serial port. We built two of these prototypes, at a cost similar to an off-the-shelf solution, had one existed. These are just a few representative examples of the custom electronic solutions we've provided for industrial and commercial customers. Thinking Devices is also developing products for internal manufacturing and direct marketing. These internal products are being developed in the background. We have adequate capacity to develop custom products for our customers, while using the internal product development to remain productive when outside work slows. This allows maximized utilization of our resources while ensuring fast response to customer needs.